You spend a lot on buying jeans and jackets especially when you find your favorite denim outfit. You truly enjoy and love when you got the chance to flaunt your styling with denim and denim symbolize a unique and catchy fashion statement to all of us. But the sad moment, when you got to put that away, or throw, is heartbreaking, right? Stop! You need not to do that, at all! 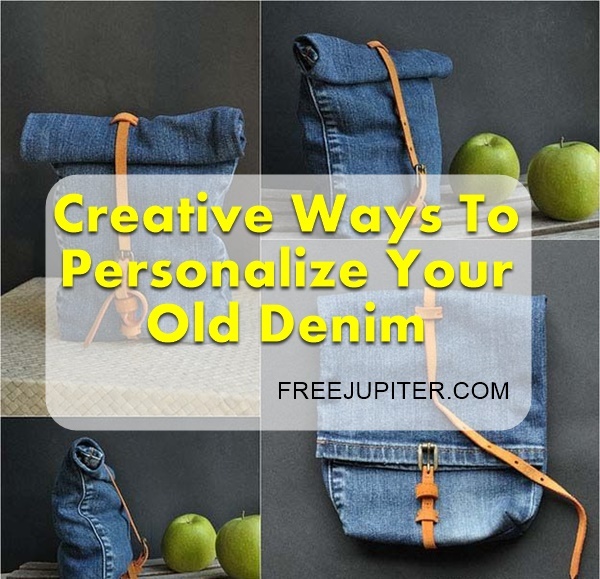 Today, we’re going to help you out with the seven creative ways to personalize your old denim clothes. 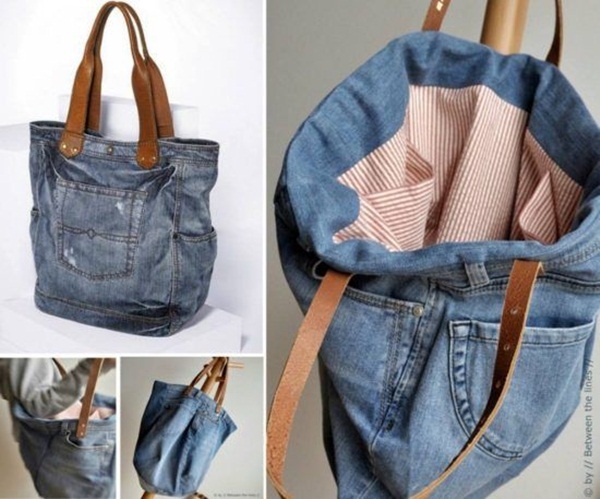 Let’s learn to reuse the best and adorable denim jackets and jeans. Since you have been very close to denim what would else you love to do with that as it’s no more of use or like never before! Don’t worry, you can still wear it or can use it for other purposes just follow the below given DIY instructions. The best idea would be making a DIY craft for the fun. Darling, you have been admiring him especially when he wears denim and we know at time you may jealous of him! But, you better deserve his denim jean but, few things must be done before you get yourself into it. Let’s make some tiny holes by the sharp edges of metallic hook. And once it’s done you are ready with the valuable ripped jeans, moreover, you have raised its prices and made it look expensive this way! Where you put those small but important paper, cards, notices, your shopping list or other very helpful things in your home? You may go for the cabinets or on the table but it’s not that safe here. And today, as we all are inclined to all catchy and stylish things, grab all the worn denim jeans and the jackets (we actually need pockets)! Now, glue them on a board or you could use a denim shirt. No more shiny and hard-stuff hand bags, let’s bring yourself a handmade easy-going and decent bag. 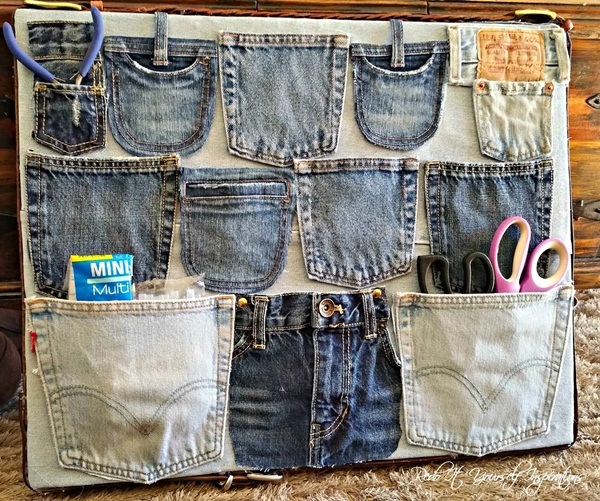 Get yourself a jean and cut out the legs safely but make sure to keep the pockets safe as you got to craft it that way so you can use pockets as outside pockets of the handbag. And now, get the leather belts or you can use of any material and instead of sewing the handles, prefer to rivet those with perfect rivet tools. 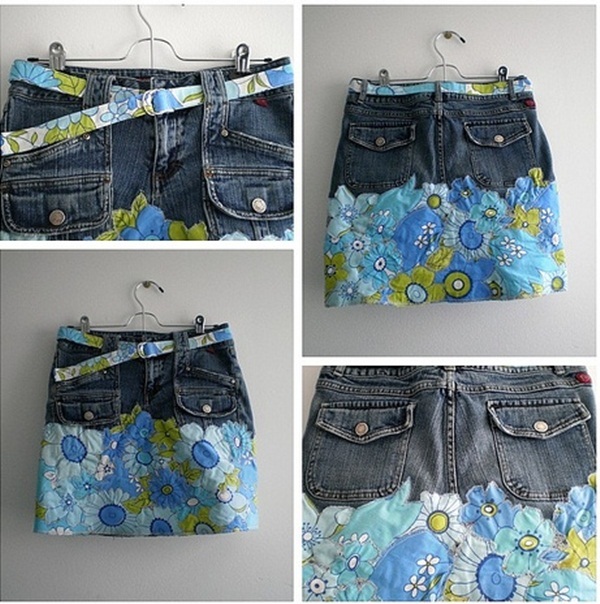 You may have denim skirt, right? But have you got the floral prints over it? Nobody does! Just cut down the legs of your jeans up to the hips and now sew those awesome designs of patterns on it. Tip- you can consider the floral and small check printed designs to craft the mini denim skirt and nail the street fashion. Yes, ever heard of denim blow? Maybe not yet! But as you know most of the times we got to spend hours in living rooms, especially when the guests arrive. Just think about giving them catchy and impressive welcome and it’s quite cozy as well. 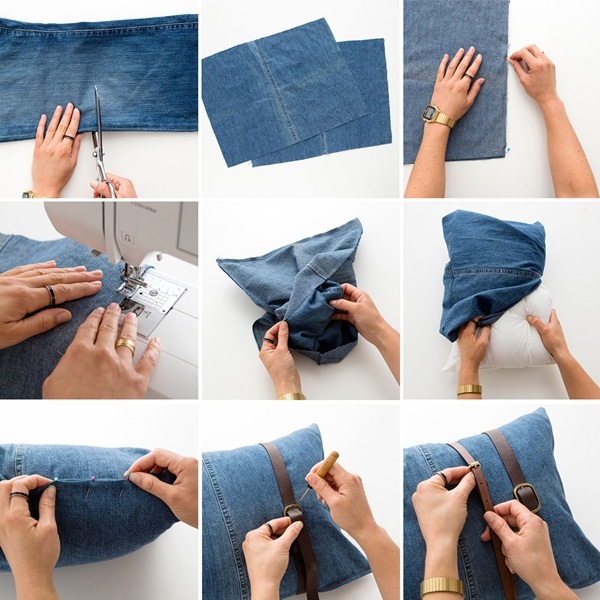 Cut down the denim jeans or shirt in a rectangular way so that you can cover up the pillow and now as shown in image, follow the instructions and get it done. you truly love to travel? Of course you do! There are moments when you got no perfect bag as sometimes it’s huge and at times it’s small but no required size of bag. 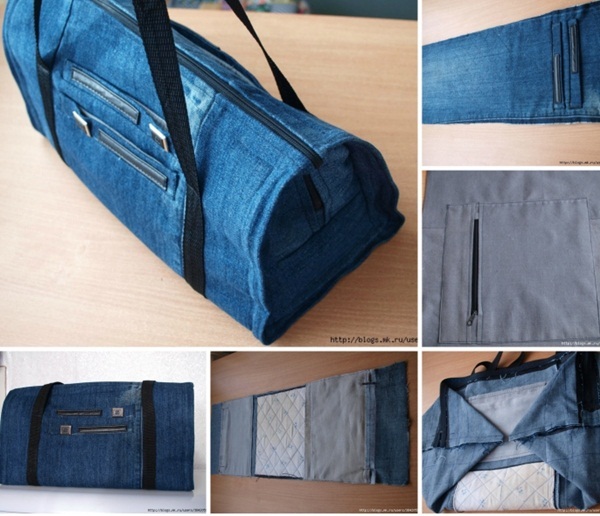 But, with this denim DIY draft idea you can have yourself a stylish and spacious bag. 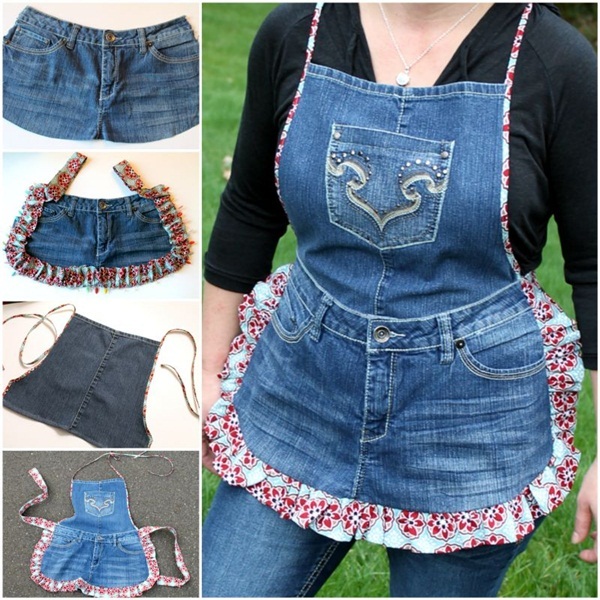 Aprons can be worn anywhere you want to keep yourself away from dirt, it could be garden, farm or a kitchen. And your denim jacket could bring you that one mandatory and stylish apron design. 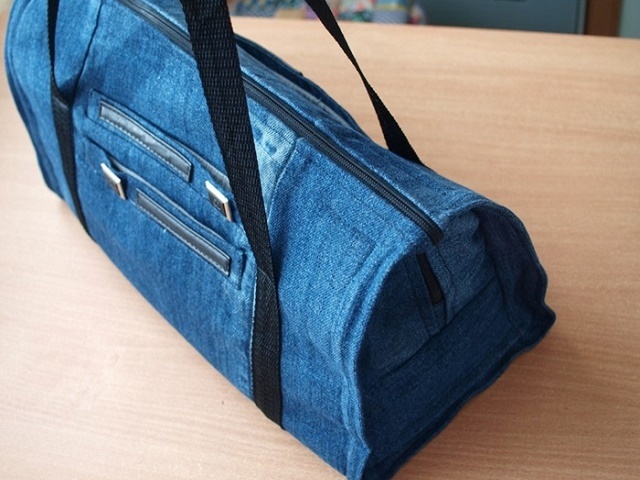 So, do let us your feedback and ideas about ways to personalize your old denim clothes in comment section and do share this post if you find it helpful.